Health	Nitro Genix 365 Review – Do You Need it? Think about it. It’s been a hard day at work. Your boss’s been a nightmare, deadlines are coming so fast even the daylight can’t keep up with them, and your colleagues are stupid. You head home. Your wife’s still at work, the babysitter leaves and the kids run wild. You open up the cabinet and see… chips, candy, and cookies. You grab a handful of chocolate chunks and head to the La-Z-Boy. Eat two in one bite. Then take a breath. Finally. Though they taste like heaven, cookies, chips, and pop aren’t good for you. They’re full of sugar, empty carbs, and preservatives. They can cause weight gain, stress on your heart, and a higher risk of diabetes. These foods may be addictive but they are horrible for your fitness goals. 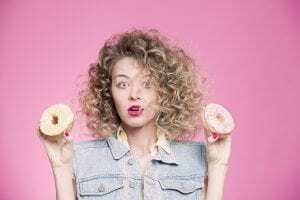 Many times, after you’ve set fitness goals, you may have a “cheat meal” and eat some foods that aren’t usually part of your new and improved diet. When you decide to break from your diet, you’ll want to avoid these seven foods. Fried balls, or holes, of dough, sometimes frosted or filled with jelly, Doughnuts taste amazing and they’re super affordable. Just head to any Krispy Kreme and you can buy a dozen for about $10.00. But this amazing taste comes with an extreme amount of carbs, fats, and calories. Add the preservatives used to keep the donuts good for long amounts of time on the store shelves and you have a recipe for illness. Doughnuts cause rapid weight gain and decrease the functioning of your digestive system. Bagels are often recommended for breakfast, but just one bagel can have 70 grams or more of carbohydrates. With this amount of carbohydrates, weight gain is a sure thing. Bagels also increase insulin and inflammation in the body due to their very high glycemic index. How can an increase in insulin and inflammation harm you? They can worsen acne, cause rosacea, and age you. So, just by enjoying those plain or onion bagels you will be adding pounds to your body, wrinkles, and redness. This isn’t talking about every cereal, such as Cheerios or Corn Flakes. 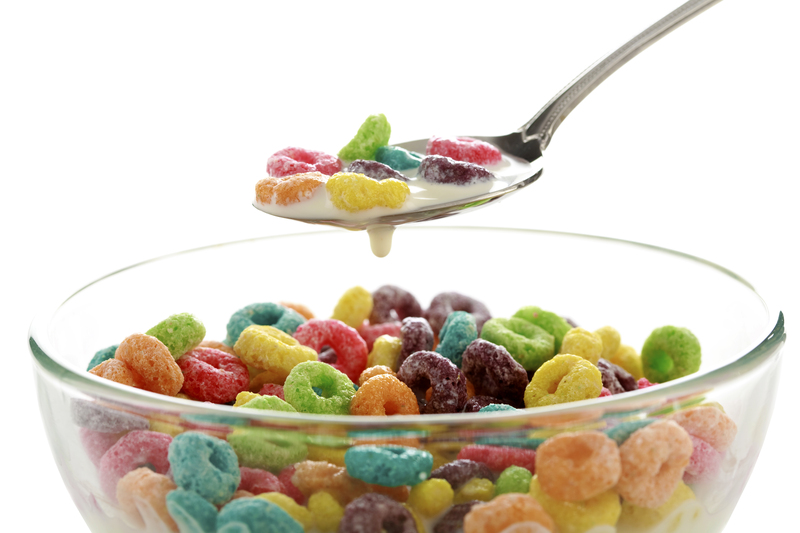 To do the worst damage to your health, the sugary cereals are the culprit. They have massive amounts of sugar and gluten, which can cause a lot of inflammation in your body. Just by itself, gluten can break out your skin and inflame the lining of your stomach. If you have children, leave these sugary cereals for them only on rare occasions. Just like you don’t want your stomach to be inflamed, neither do you want theirs. When shopping or ordering online, look for the boring cereals. You know, the ones without fun characters and tons of colors. Go for the “plain” cereals, add some fruit, and enjoy the benefits. Known for their salty goodness, chips are full of the possibility of coronary heart disease. These deep-fried potatoes are full of trans fats that raise your cholesterol levels to numbers you may have never seen before. In chips, trans fats are found in the vegetable oil, which has been loaded with hydrogen, so the oil won’t spoil. 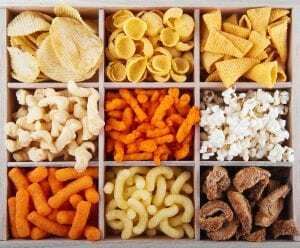 These trans fats preserve the chips, increase freshness, and lower greasiness, but they’re horrible for you and should be avoided at all costs. For a healthy snack that won’t give you a heart attack, eat pretzels or make some chips at home. Just 30 minutes and you’ve saved yourself from ruining your heart. 2 – 14%. Those are the numbers for fast-food burgers. Which numbers, you may ask. The amount of actual meat within that beef patty. For all food chains, 14% is a stretch. The average is just 12%. The rest of your burger is full of cartilage, bone, water, and other “fillers”, i.e. you don’t want to know. Most of these other bits your body can’t even use. Not only are they filled with 86% of other bits, fast food burgers are packed with saturated fats, and trans fats. Cook at home. Buy real meat. Preferably lean. If you don’t plan to air pop, stop. Microwave popcorn is full of cancer. Well, not cancer, but cancer-causing ingredients. The bag, just by itself, contains carcinogens; free radicals that are known to leave you with cancer. These bags also have perfluorochemicals (PFCs), which can lead to thyroid disease and ADHD, to name a few. Why do they even use these PFCs? To keep the bag grease-proof. Hmm, that doesn’t seem like a fair trade. In addition to the chemical taste of microwave popcorn, it also has artificial fats full of genuine cancer-causing diacetyl. So, get a popcorn popper. Pull some kernels in and air pop. It’s quick, simple, and so much better than microwaved. Known as a healthy substitute for butter, because it is cholesterol-free, margarine is actually full of trans fats, which are full of cholesterol. It’s good that you’re eating a nice healthy piece of whole wheat toast, but that changes when you spread some margarine on it. Now, you’re eating tons of trans fats, pushing your cholesterol sky high, and damaging the walls of your blood vessels. Always, read the food labels and buy if you see omega-3 fats. You only have one body. One brain. Your body feeds your brain. Eat the right thing and enhance your mood, get fit, and teach your children to eat well, too.